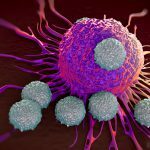 Last week, some of the world’s leading cancer researchers gathered in Mainz/Frankfurt, Germany for the Third International Cancer Immunotherapy Conference: Translating Science Into Survival. The conference, which was attended by more than 1,400 scientists from around the world, was jointly sponsored by the Cancer Research Institute (CRI), the Association for Cancer Immunotherapy (CIMT), the European Academy of Tumor Immunology (EATI), and the American Association for Cancer Research (AACR). The opening day’s program on Wednesday spanned topics including cancer neoantigens, novel mechanisms of immunosuppression, and immune evasion. Our conference co-organizer CRI covered the program on its blog, Immune to Cancer. Thursday’s program covered the latest research on biomarkers, drug development, and adoptive cell therapies. The full program is detailed in this CRI blog post. On the third day of the conference, researchers discussed combination therapies, checkpoint blockade, and microbiota. The conference wrapped up on Saturday with discussions on targeting “hostile elements” in the cancer microenvironment and the utility of oncolytic viruses as therapeutic vaccines. Thanks to the CRI blog staff for daily coverage of this important conference.